The Alexander Cemetery is on the J. M. Kincaid survey. The first grave was that of William Alexander in 1855. The cemetery was given to the "precinct" by James Alexander in 1890 in Vol 46, p 382. It covers about 2 acres of land and is near Hurricane Creek. This cemetery is fenced with a 4-foot chain-link fence and a gate. 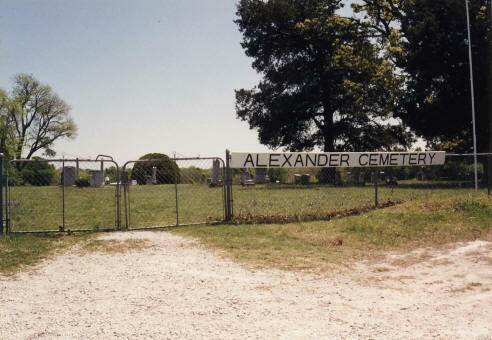 There is a large wooden sign on the fence saying "Alexander Cemetery." There were once several bois d'arc markers. One wooden marker has become embedded in some tree trunks over the years. Slaves were buried in their masters' family plots. The cemetery has several cedar trees and 2 large burr oaks. 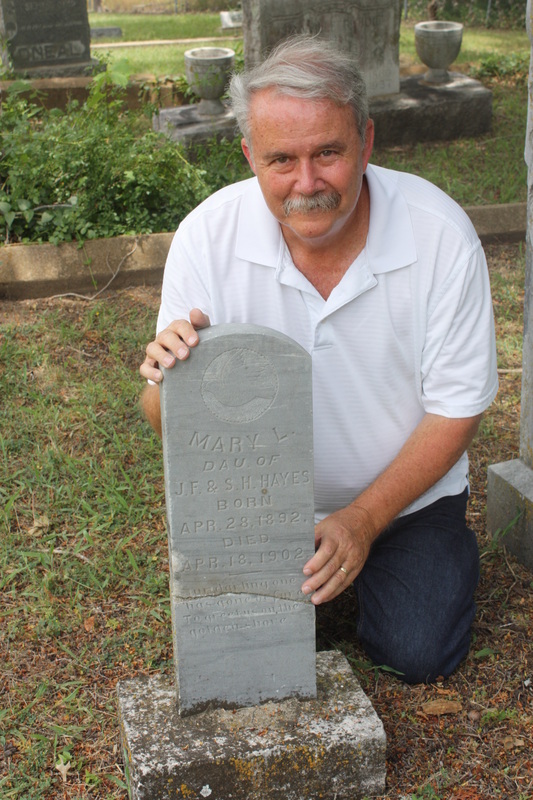 The tombstone of Mary Hayes has been returned to its original site--/perfectly fitting it/ to the base from which it was broken years ago—at Alexander Cemetery outside the small town of Weston, near McKinney, in Collin County, Texas. The stone was found lying face up in a vacant lot adjacent to the Texas State University campus in San Marcos. It came into the possession of the Hays County Historical Commission when a TSU student’s father spotted it and reported it to county officials last December. University police determined it was on TSU property and allowed HCHC to take it with the stated intention of trying to return it to its point of origin. THANKFULLY, several folks at Texas State had been “on the case” long before HCHC got any call and had, in fact, determined the stone’s North Texas origin. University Archivist and Records Manager Kris Toma had led the research after employees at TSU’s Swinney House spotted the stone last November. Kris had reached Richard Hollis, who was instrumental in determining the stone’s original site—and we eventually included Joy Gough, Historical Marker and Cemetery Chair for the Collin County Historical Commission, in the conversation. Best to all of you who had a hand in this “restoration” of this stone to the young girl’s gravesite some 110 years and two months after her death!